Oh wow, these look fantastic! I love cherries and it's not cherry season in Australia for months. I have bookmarked this and I'll check back for the other wonderful things you're going to come up with! What a heavenly looking treat! Wonderful. I agree with Maureen - tremendous - however, my local supermarket is brimming with cherries - imported from the U.S. of A. IN THE MIDDLE OF WINTER! Im leaving then be and will wait for my mid summer farmers market to get some in and give this a crack! 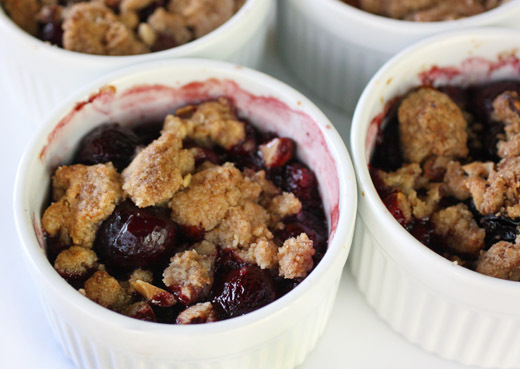 I love any cherry recipe, they always look good! These look great! Love the addition of the cherry beer. Can't wait to see a wine soaked version of this. The combination of three different cherry flavors from the fresh and dried cherries and the cherry beer sounds very intriguing. Nice! Marinated cherries deliver incredible flavour - I bet the combination of lambic beer, honey and vanilla is sensational in these crisps. The individual servings are fun and I love the chopped almonds for topping. Wow! I'd like to try these but I'm not sure where I'd find the cherry beer. There has to be a store in this city that sells it! Lisa, what a great dessert with cherry, specially that cherry is in season. Love the individual dishes as well. They looks so delicious Lisa. I never made anything like this, perhaps soon. I was looking out for cherries too, esp organic ones. I bought some at my local Whole Foods yesterday since there were on sale ($3.99/lb). Better enjoy cherries as much as possible before the season ends. Seems a short season to me. I adore cherries - this sounds like a wonderfully tasty treat! Wow this crisp is truly sensational! Don't the organic cherries seem to taste significantly better than the regular kind? You put them to great use! I like the idea of mixing two kinds of cherries too. And when I make mine again, I'm going to add a bit of orange zest. I'm not a beer drinker so have never even heard of cherry beer....but these look marvelous! Cherries are really amazing berries. You can't get them whole year sadly and can enjoy for a quite short time..
Lisa this crisp looks wonderful! Thankfully, I got in on that WF organic cherry one day sale, too! Stocked up! I bet this is perfect with the cherry beer. Love the flavor profile of this dish. Lemon zest was a wise choice. 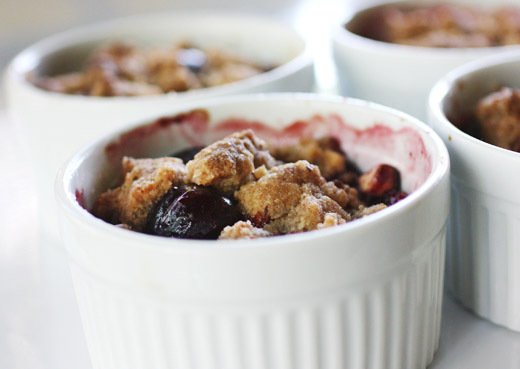 I made this too, and I thought it was one of the best desserts using cherries I have ever had. Loved it! golly, cherries are beautiful. i think they rival blueberries for the "most exquisite and picturesque fruit to be used in baked goods" award. meanwhile, cherry beer? never knew it existed. I missed that sale! Organic cherries are really hard to find. 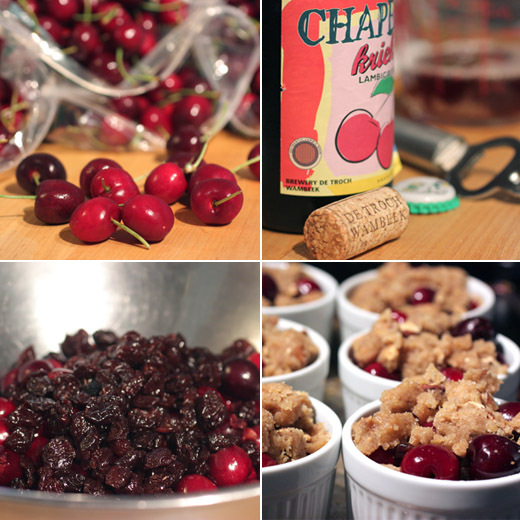 I love the combination of fresh and dried cherries with beer in this crisp, so creative! Cherry lambic? Cherry beer? How unusual and so intriguing! But cherries drive me wild I love them so much and the blend of fresh and dried is even better. This really is a great twist on such a loved treat.